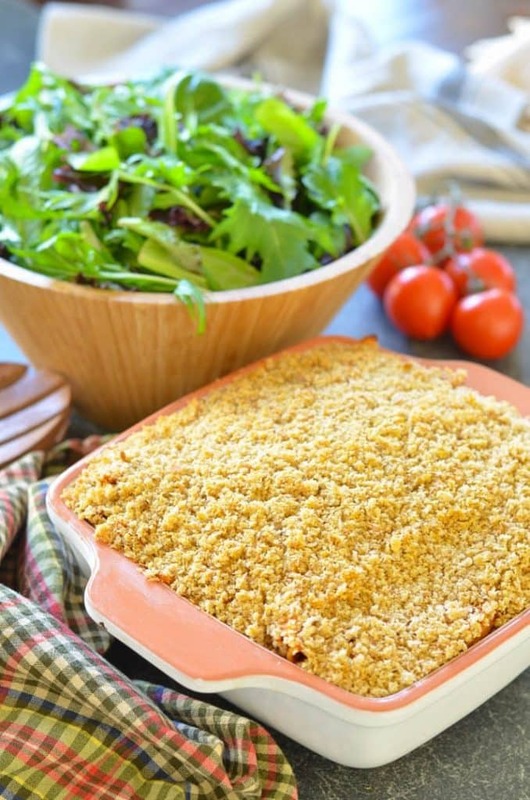 This Tomato Pasta Bake with Garlicky Crumb Topping is a budget friendly, hearty & delicious meal that the whole family will love! Pasta dishes tend to be real crowd pleasers and this Tomato Pasta Bake with Garlicky Crumb Topping is no exception. It’s cozy, deep dish pasta heaven and the whole family will love it. It’s been a while since I shared a pasta dish. I think the last one to make it to the blog was my Creamy Vegan Pesto Pasta Salad and that was in the summer. It’s odd as pasta is a go to meal in our housed I have loads of different recipes I regularly make. I obviously need to get a move on and share them with you! 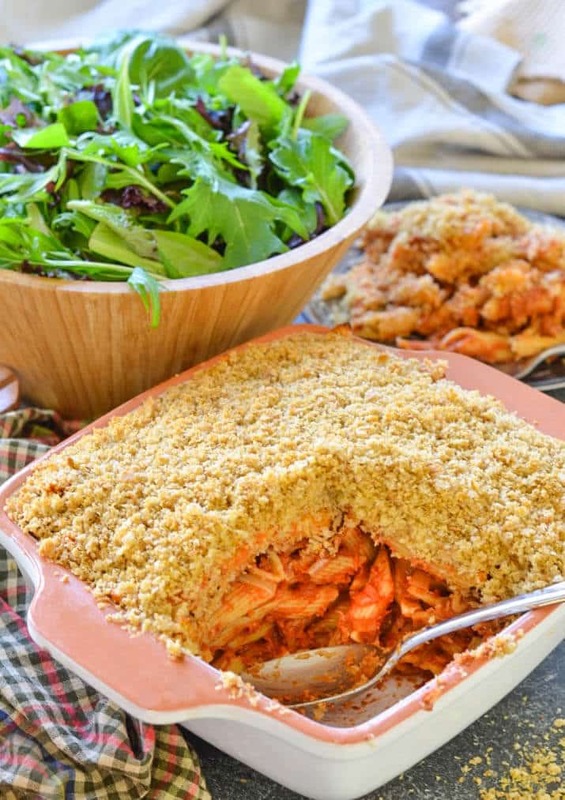 This Tomato Pasta Bake with Garlicky Crumb Topping is easy enough for a mid week dinner, taking no more than about fifty minutes tops. It is also a fabulous way to give leftover stale bread a new garlicky and delicious lease of life. I don’t know about you but we always end up with a few slices that are past their best by the time we get to the end of a loaf. The tomato sauce is rich and deeply flavoured thanks to the addition of nutritional yeast and balsamic vinegar. Once baked together with the pasta and the garlicky crumbs, the flavours and textures are so good. The top crumbs become crunchy and golden and the ones underneath soak up some of the sauce. It’s such a good combo! As well as being a great family meal, this recipe is perfect for those times when you are tasked with feeding a crowd. It makes a generously sized casserole full and can be easily doubled or tripled. It can also be made in advance. If you wish to do this, just get it all together in the casserole then refrigerate before the baking stage. When you are ready for it, bake as directed. Serve with a nice fresh, crispy salad and if you feel like splurging, a big glass of red wine too! ???????? 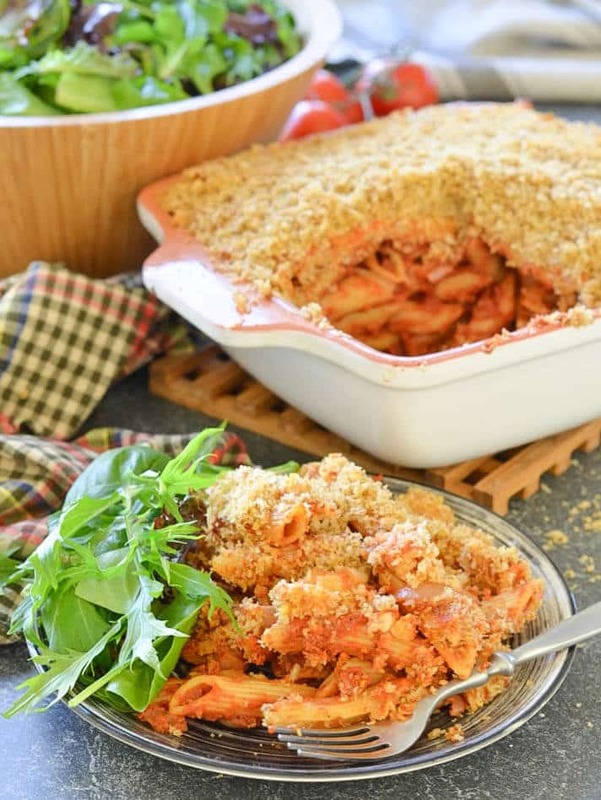 This Tomato Pasta Bake with Garlicky Crumb Topping is a real favourite here and I have been making it frequently. Even my very fussy teenage son eats it with no complaints. He also eats salad with it as long as I drizzle balsamic vinegar over it first. Now there’s a win. Moan free meals are always a bonus! ???? 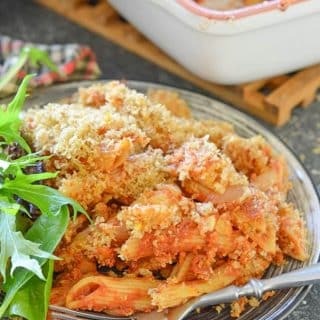 You must try this cozy tomatoey, crumbly, garlicky pasta bake, and when you do, let me know what you think in the comments below, or share a pic on Instagram. I am @avirtualvegan. Use the hashtag #avirtualvegan so I don’t miss them. 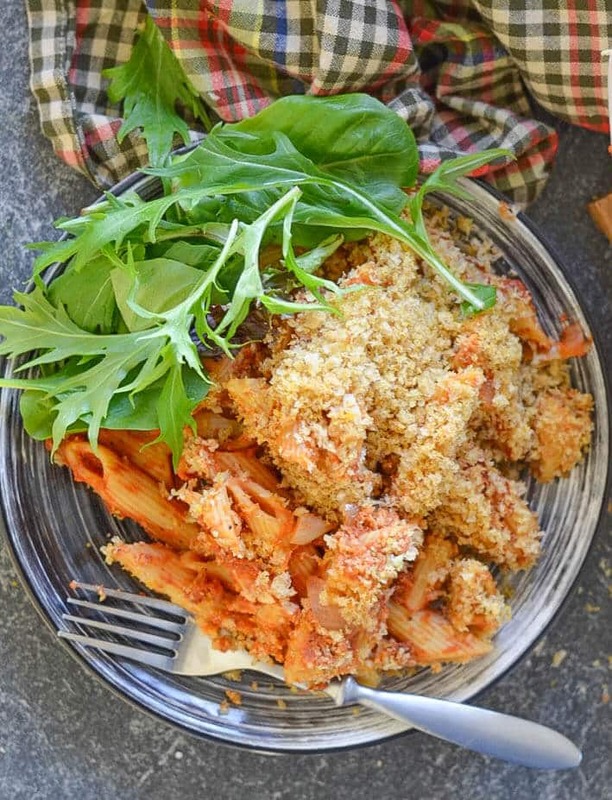 500 g pasta use gluten-free pasta to make gluten-free, fusilli or rigatoni both work well. Warm the olive oil in a pan then sauté the onions until just turning golden brown. Use a few drops of water instead of the olive if you want to keep this oil-free. Add the garlic and cook for one minute more. Add the tomatoes, chili, herbs, nutritional yeast, balsamic vinegar, salt & pepper and stir well. Leave to simmer on low while you cook the pasta. Cook pasta in a large pan of boiling water until just al-dente. While the pasta is cooking, break the bread up roughly with your hands and add to the bowl of a food processor or blender. Add 2 tablespoons of olive oil, garlic and nutritional yeast. Process until fine crumbs. Set aside. Drain pasta then pour the sauce and stir well to combine. Pour the saucy pasta into a large casserole dish, smooth the top a bit with a spoon, then sprinkle over the breadcrumb mixture evenly. Bake for 20 – 25 minutes or until the crumb topping is golden and crunchy. Leftovers can be reheated in a loose lidded container in the microwave or the oven. This recipe has been entered into the Tinned Tomatoes Meat Free Monday Link Up.